2D Architectural drawings extracted from point clouds can be both highly accurate and highly detailed, the limitation to both is down to the accuracy that can be achieved within the point cloud itself. 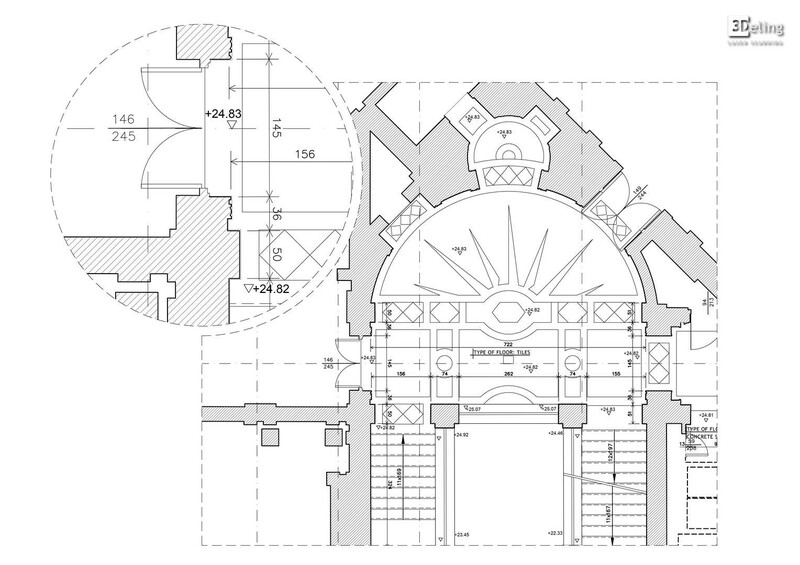 For the majority of architectural drawings, bandings associated with historic 1:50 and 1:100 plot scales are usually more than adequate. It is important at quotation stage to determine what the requirements are and which elements are Important to any project. Level of detail and accuracy is directly proportionate to the time required to develop the product and therefore impacts both time and cost. 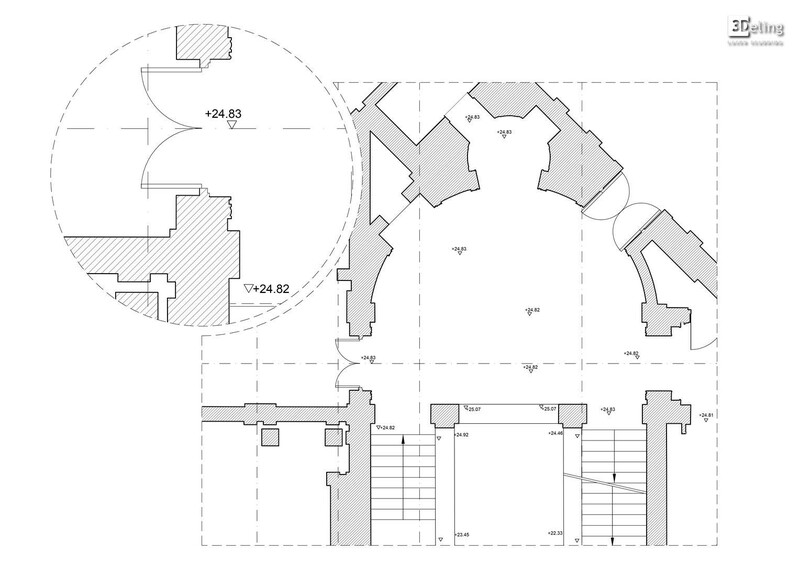 Below we have outlined 3 Levels of detail (Lod) for 2D deliverables. These should be taken as guides as a starting point. 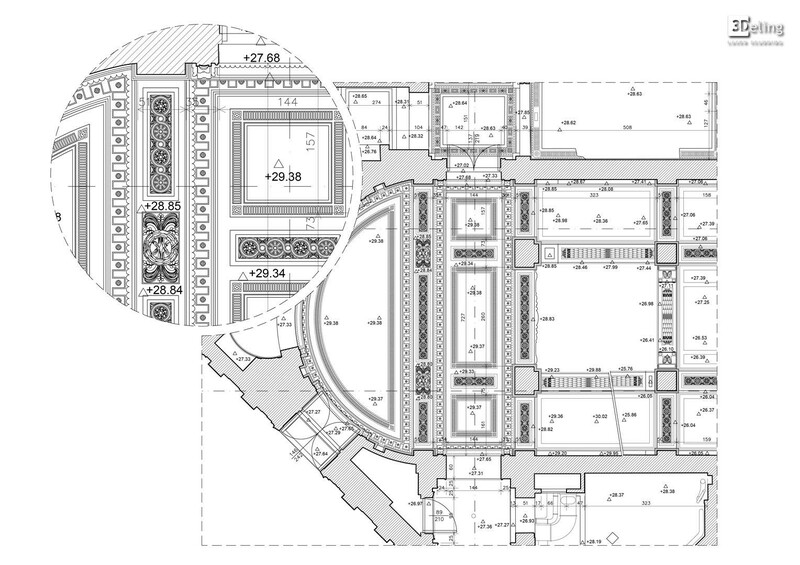 Each example can be enhanced or reduced either across an entire project or a specific area to suit the unique needs of your project. 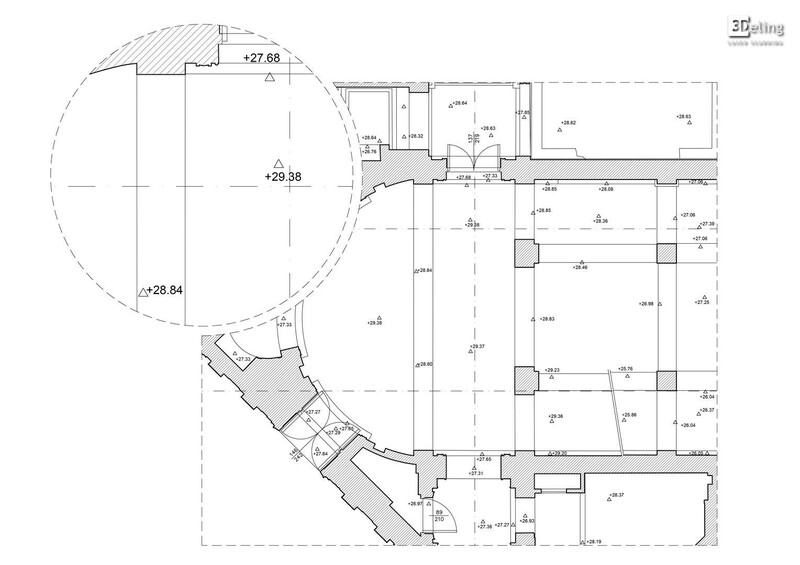 Basic outline information suitable for planning, lease plans, space planning, fire drawings or feasibility studies. Includes all main structural elements. Walls, windows doors etc. no level or height information. Typically drawn at 1:50 showing all structural and architectural information. 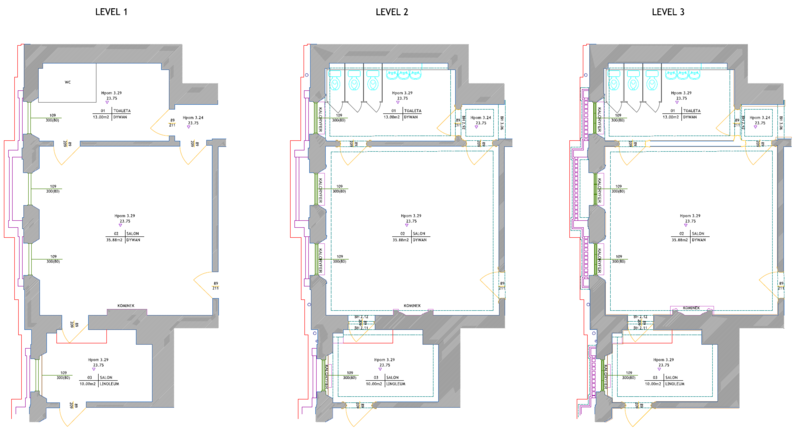 Floor levels, height information basic fixtures and fittings. 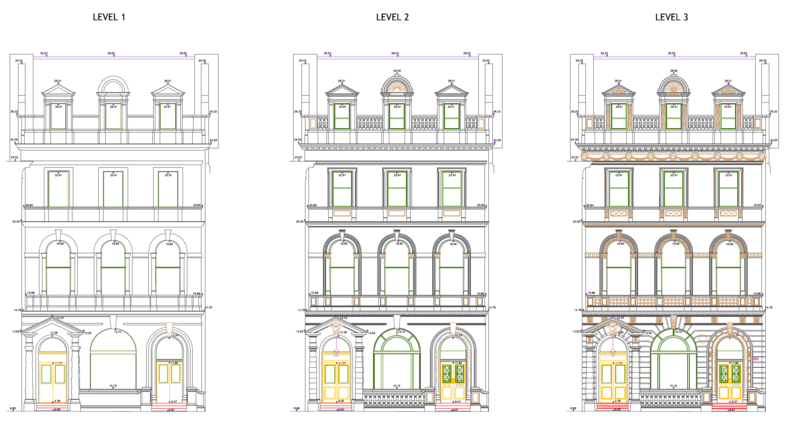 Elevations will show enhanced architectural features. 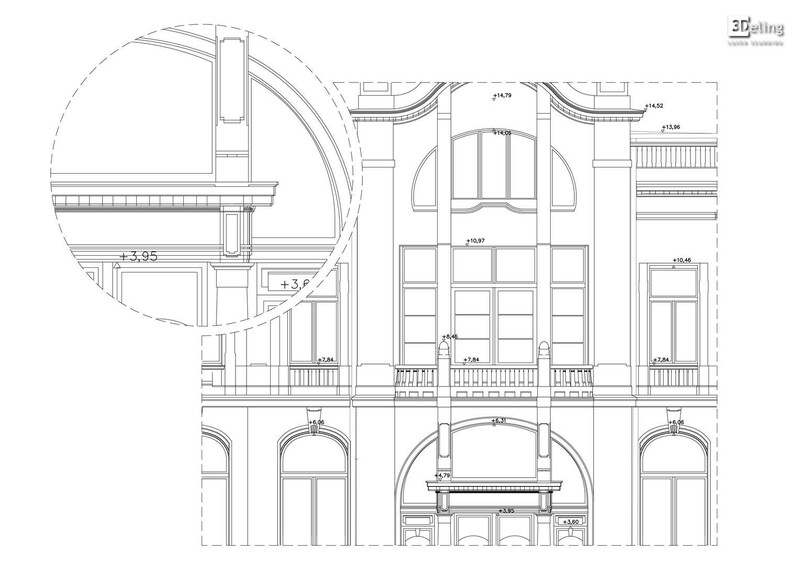 Sections may include basic elevation detail as an option. Could be used for record drawings, refurbishment, Feasibility surveys. 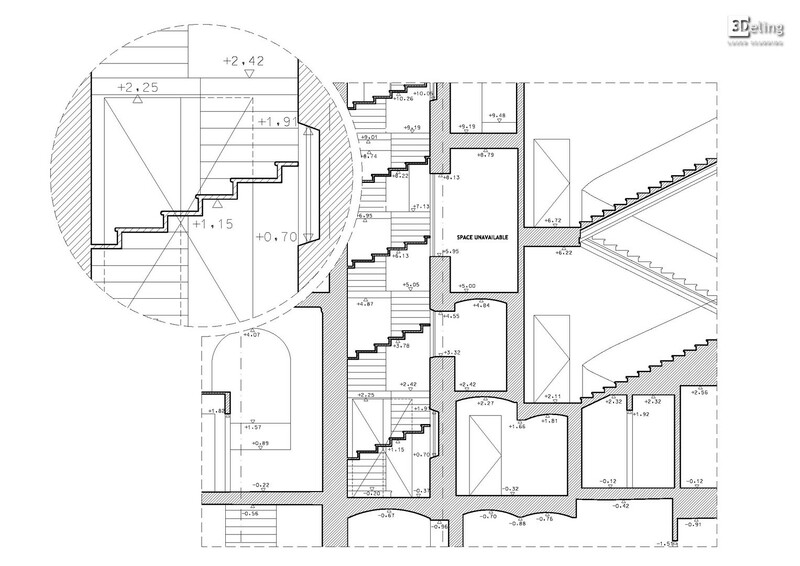 Floor levels, height information fixtures and fittings, ceiling details. May also include a greater degree of services information. 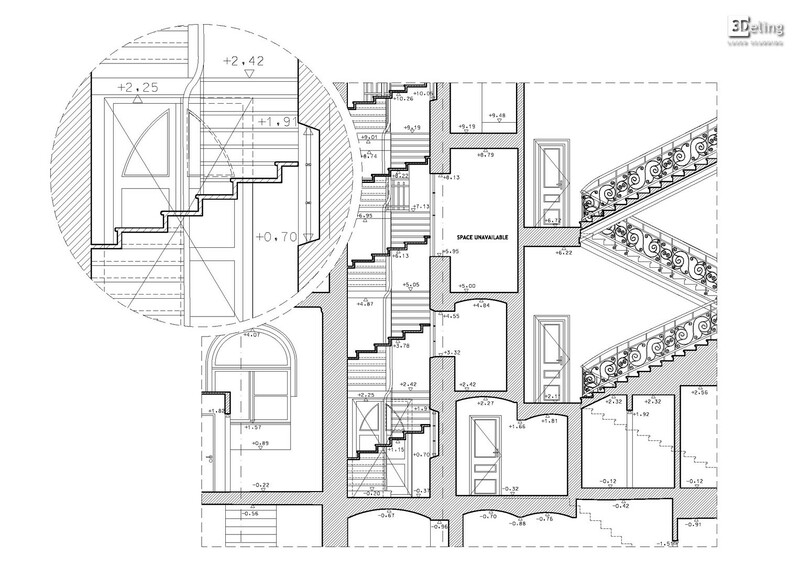 Elevations will show all architectural features and details. 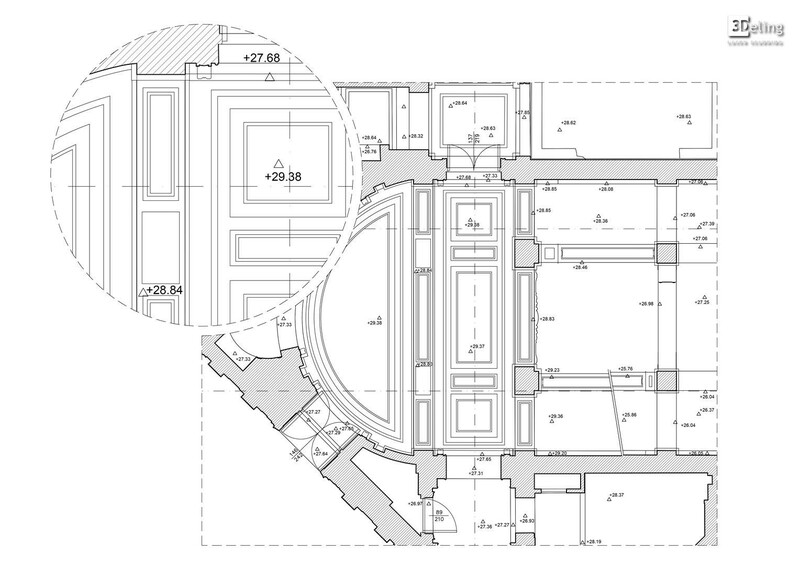 Sections may include detailed elevational information as an option. Could be used for refurbishment, structural alterations, heritage recording. 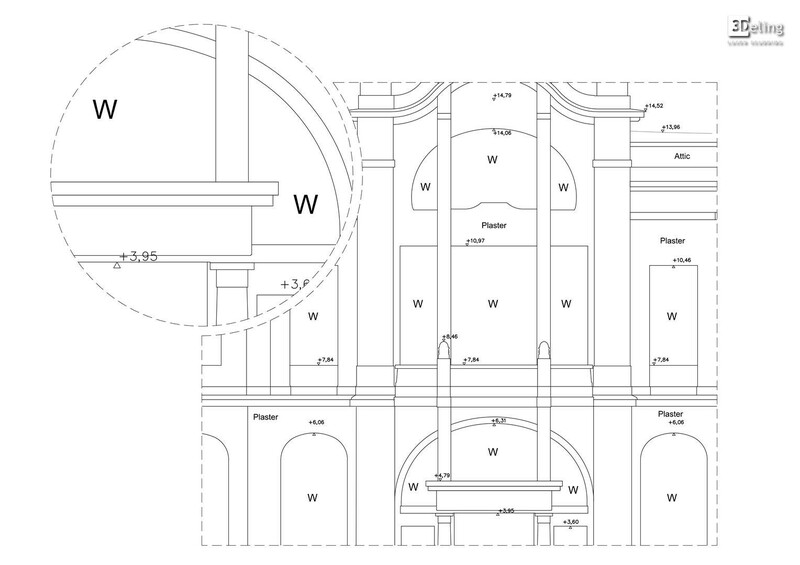 Here you can find a standard specification of our drawings. 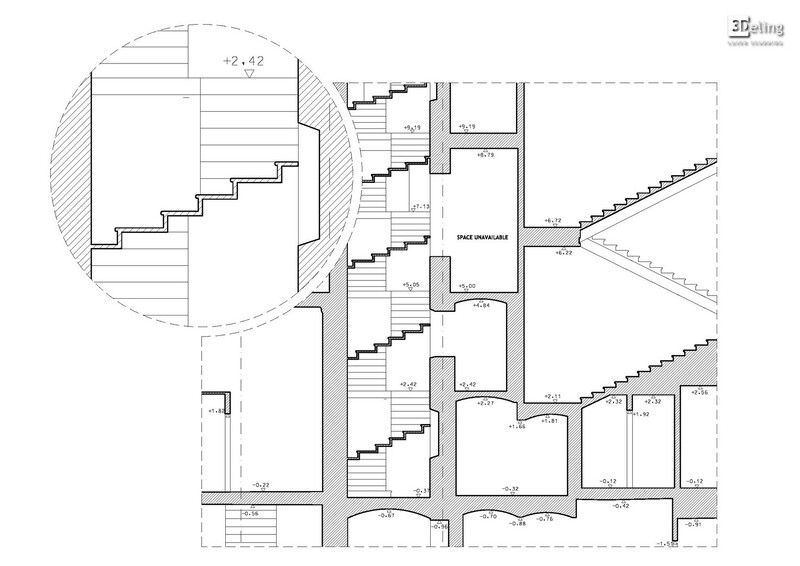 If you need other specification for your project you can send us a sample drawing. We always take into account all client's requests. To fill in the form, please download the file and open it in Adobe Reader. 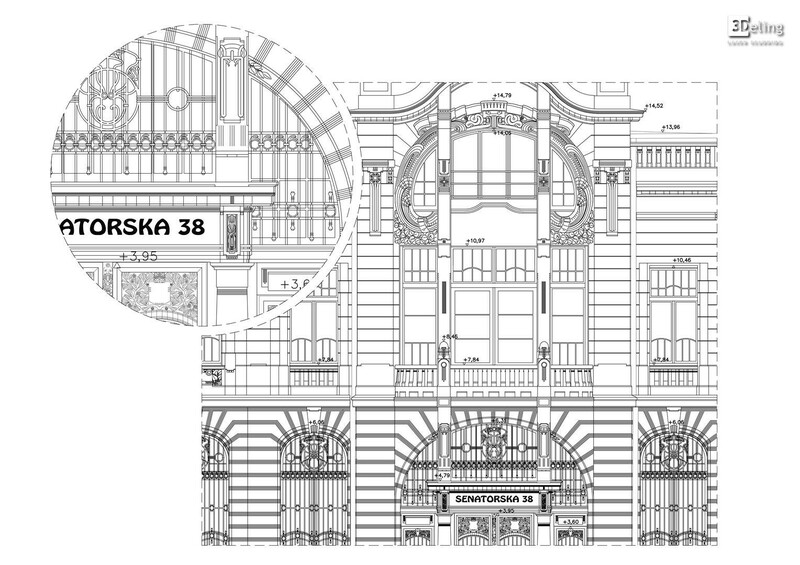 Here you can find examples of projects with different Levels of Detail. It is a 3D PDF file, that's why we recommend opening it in Adobe Reader.